For other uses, see André Breton (disambiguation). André Breton (French: [ɑ̃dʁe bʁətɔ̃]; 18 February 1896 – 28 September 1966) was a French writer, poet, and anti-fascist. He is known best as the co-founder, leader, principal theorist and chief apologist of Surrealism. His writings include the first Surrealist Manifesto (Manifeste du surréalisme) of 1924, in which he defined surrealism as "pure psychic automatism". Born to a family of modest means in Tinchebray (Orne) in Normandy, France, Breton attended medical school, where he developed a particular interest in mental illness. His education was interrupted when he was drafted for World War I. During World War I he worked in a neurological ward in Nantes, where he met the devotee of Alfred Jarry, Jacques Vaché, whose anti-social attitude and disdain for established artistic tradition influenced Breton considerably. Vaché committed suicide when aged 24, and his war-time letters to Breton and others were published in a volume entitled Lettres de guerre (1919), for which Breton wrote four introductory essays. Breton married his first wife, Simone Kahn, on 15 September 1921. The couple relocated to rue Fontaine No. 42 in Paris on 1 January 1922. The apartment on rue Fontaine (in the Pigalle district) became home to Breton's collection of more than 5,300 items: modern paintings, drawings, sculptures, photographs, books, art catalogs, journals, manuscripts, and works of popular and Oceanic art. He was an atheist. Breton launched the review Littérature in 1919, with Louis Aragon and Philippe Soupault. He also associated with Dadaist Tristan Tzara. In 1924, he was instrumental in the founding of the Bureau of Surrealist Research. In Les Champs Magnétiques (The Magnetic Fields), a collaboration with Soupault, he implemented the principle of automatic writing. He published the Surrealist Manifesto in 1924, and was editor of the magazine La Révolution surréaliste from that year on. A group of writers became associated with him: Soupault, Louis Aragon, Paul Éluard, René Crevel, Michel Leiris, Benjamin Péret, Antonin Artaud and Robert Desnos. Anxious to combine the themes of personal transformation found in the works of Arthur Rimbaud with the politics of Karl Marx, Breton joined the French Communist Party in 1927, from which he was expelled in 1933. Nadja, a novel about his encounter with an imaginative woman who later became mentally ill, was published in 1928. Breton celebrated the concept of Mad Love, and many women joined the surrealist group over the years. Toyen was a good friend. During this time, he survived mostly by the sale of paintings from his art gallery. In 1930, Un Cadavre, a pamphlet, was written and released by several members of the surrealist movement who were insulted by Breton or had otherwise disbelieved in his leadership. :299-302 The pamphlet criticized Breton's oversight and influence over the movement. It marked a divide amidst the early surrealists. In 1935, there was a conflict between Breton and the Soviet writer and journalist Ilya Ehrenburg during the first International Congress of Writers for the Defense of Culture, which opened in Paris in June. Breton had been insulted by Ehrenburg—along with all fellow surrealists—in a pamphlet which said, among other things, that surrealists were "pederasts". Breton slapped Ehrenburg several times on the street, which resulted in surrealists being expelled from the Congress. René Crevel, who according to Salvador Dalí was "the only serious communist among surrealists", was isolated from Breton and other surrealists, who were unhappy with Crevel because of his bisexuality and annoyed with communists in general. In 1938, Breton accepted a cultural commission from the French government to travel to Mexico. After a conference at the National Autonomous University of Mexico about surrealism, Breton stated after getting lost in Mexico City (as no one was waiting for him at the airport) "I don't know why I came here. Mexico is the most surrealist country in the world". However, visiting Mexico provided the opportunity to meet Leon Trotsky. Breton and other surrealists traveled via a long boat ride from Patzcuaro to the town of Erongarícuaro. Diego Rivera and Frida Kahlo were among the visitors to the hidden community of intellectuals and artists. Together, Breton and Trotsky wrote the Manifesto for an Independent Revolutionary Art (published under the names of Breton and Diego Rivera) calling for "complete freedom of art", which was becoming increasingly difficult with the world situation of the time. In 1942, Breton collaborated with artist Wifredo Lam on the publication of Breton's poem "Fata Morgana", which was illustrated by Lam. Breton was again in the medical corps of the French Army at the start of World War II. The Vichy government banned his writings as "the very negation of the national revolution" and Breton escaped, with the help of the American Varian Fry and Harry Bingham, to the United States and the Caribbean during 1941. Breton got to know Martinican writer Aimé Césaire, and later composed the introduction to the 1947 edition of Césaire's Cahier d'un retour au pays natal. During his exile in New York City he met Elisa Bindhoff, the Chilean woman who would become his third wife. In 1944, he and Elisa traveled to the Gaspé Peninsula in Québec, where he wrote Arcane 17, a book which expresses his fears of World War II, describes the marvels of the Rocher Percé and the extreme northeastern part of North America, and celebrates his new romance with Elisa. During André Breton's visit to Haiti in 1945-46, the French surrealist leader sought to connect surrealist politics and automatist practices with the legacies of the Haitian Revolution and the ritual practices of Vodou possession. Recent developments in Haitian painting were central to his efforts, as can be seen from a comment that Breton left in the visitors' book at the Centre d'Art in Port-au-Prince: "Haitian painting will drink the blood of the phoenix. And, with the epaulets of [Jean-Jacques] Dessalines, it will ventilate the world." Breton was specifically referring to the work of painter and Vodou priest Hector Hyppolite, whom he identified as the first artist to directly depict Vodou scenes and the lwa (Vodou deities), as opposed to hiding them in chromolithographs of Catholic saints or invoking them through impermanent vevé (abstracted forms drawn with powder during rituals). Breton's writings on Hyppolite were undeniably central to the artist's international status from the late 1940s on, but the surrealist readily admitted that his understanding of Hyppolite's art was inhibited by their lack of a common language. Returning to France with multiple paintings by Hyppolite, Breton integrated this artwork into the increased surrealist focus on the occult, myth and magic. In 1941, Breton left France due to World War II. He emigrated to New York City and lived there for a few years. In 1942, Breton organized a groundbreaking Surrealist exhibition at Yale University. Breton returned to Paris in 1946, where he opposed French colonialism (for example as a signatory of the Manifesto of the 121 against the Algerian war) and continued, until his death, to foster a second group of surrealists in the form of expositions or reviews (La Brèche, 1961–65). In 1959, he organized an exhibit in Paris. By the end of World War II André Breton decided to embrace anarchism explicitly. In 1952 Breton wrote "It was in the black mirror of anarchism that surrealism first recognised itself." Breton was consistent in his support for the francophone Anarchist Federation and he continued to offer his solidarity after the Platformists around Fontenis transformed the FA into the Fédération Communiste Libertaire. He was one of the few intellectuals who continued to offer his support to the FCL during the Algerian war when the FCL suffered severe repression and was forced underground. He sheltered Fontenis whilst he was in hiding. He refused to take sides on the splits in the French anarchist movement and both he and Péret expressed solidarity as well with the new FA set up by the synthesist anarchists and worked in the Antifascist Committees of the 60s alongside the FA." André Breton died at the age of 70 in 1966, and was buried in the Cimetière des Batignolles in Paris. Breton was an avid collector of art, ethnographic material, and unusual trinkets. He was particularly interested in materials from the northwest coast of North America. During a financial crisis he experienced in 1931, most of his collection (along with that of his friend Paul Éluard) was auctioned. He subsequently rebuilt the collection in his studio and home at 42 rue Fontaine. The collection grew to over 5,300 items: modern paintings, drawings, sculptures, photographs, books, art catalogs, journals, manuscripts, and works of popular and Oceanic art. French anthropologist Claude Lévi-Strauss, in an interview in 1971, spoke about Breton's skill in determining the authenticity of objects. Strauss even described their friendship while the two were living in New York: "We lived in New York between 1941 and 1945 in a great friendship, running museums and antiquarians together. I owe him a lot about the knowledge and appreciation of objects. I've never seen him [Breton] doing a mistake on exotic and unusual objects. When I say a mistake, I mean about its authenticity but also its quality. He [Breton] had a sense, almost of divination." After Breton's death on 28 September 1966, his third wife, Elisa, and his daughter, Aube, allowed students and researchers access to his archive and collection. After thirty-six years, when attempts to establish a surrealist foundation to protect the collection were opposed, the collection was auctioned by Calmels Cohen at Drouot-Richelieu. A wall of the apartment is preserved at the Centre Georges Pompidou. Nine previously unpublished manuscripts, including the Manifeste du surréalisme, were auctioned by Sotheby's in May 2008.
from 1945 to 1966 (his death), to Elisa Bindhoff Enet. 1934: Qu'est-ce que le Surréalisme? – Published in English as: What Is Surrealism? ^ Lawrence Gowing, ed., Biographical Encyclopedia of Artists, v.1 (Facts on File, 2005): 84. ^ André Breton (1969). Manifestoes of Surrealism. University of Michigan Press. p. 26. ^ a b c d e "André Breton". Biography.com. Retrieved 2017-04-19. ^ Henri Béhar, Catherine Dufour (2005). Dada, circuit total. L'AGE D'HOMME. p. 552. ^ Reviewing Mark Polizzotti's Revolution of the Mind: The Life of André Breton Douglas F. Smith called him, "[a] cynical atheist, the poet, critic, and artist harbored an irrepressible streak of romanticism." ^ Browder, Clifford (1967). André Breton: Arbiter of Surrealism. Droz. p. 133. Again, the atheist Breton's predilection for ideas of blasphemy and profanation, as well as for the " demonic " word noir, contained a hint of Satanism and alliance with infernal powers. ^ a b Douglas, Ava. 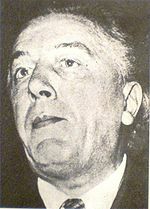 "André Breton". www.historygraphicdesign.com. Retrieved 2019-02-25. ^ Polizzotti, Mark (2009) [First published 1995]. Revolution of the Mind (Revised and updated ed.). Boston, MA: First Black Widow Press. ISBN 978-0-9795137-8-7. ^ André Breton, Fata Morgana. Buenos Aires: Éditions des lettres françaises, Sur, 1942. ^ Franklin Rosemont André Breton and the First Principles of Surrealism, 1978, ISBN 0-904383-89-X. ^ Geis, T. (2015). "Myth, History and Repetition: André Breton and Vodou in Haiti". South Central Review. 32.1. ^ a b "1919–1950: The politics of Surrealism by Nick Heath". Libcom.org. Retrieved 26 December 2009. ^ Art, Surrealism. "André Breton | Father of Surrealism". www.surrealismart.org. Retrieved 2018-01-24. ^ André Breton, 42, rue Fontaine: tableaux modernes, sculptures, estampes, tableaux anciens. Paris: CalmelsCohen, 2003. ^ "Nine Manuscripts by André Breton at Sotheby's Paris". ArtDaily.org. 20 May 2008. Retrieved 28 March 2009. André Breton: Surrealism and Painting – edited and with an introduction by Mark Polizzotti.